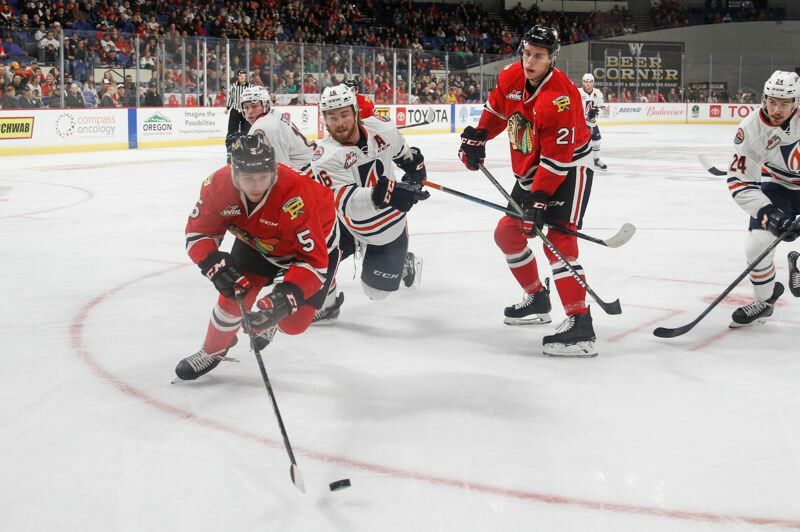 Jermaine Loewen scored three goals as the Kamloops Blazers blitzed the Portland Winterhawks 6-2 on Saturday in Western Hockey League action at Memorial Coliseum. Joachim Blichfeld and Mason Mannes scored for Portland, but Kamloops scored three times in the first period to gain control of the game. Portland's second loss in as many nights leaves it at 7-5-0-1 (15 points), fourth in the U.S. Division. Kamloops is 5-6-0-1, fourth in the B.C. Division. The same teams play again at 5 p.m. Sunday at Memorial Coliseum. Blichfeld's power-play goal put Portland up 1-0 at 6:2 of the first period. But Kamloops scored the next four goals and led 4-1 early in the second quarter. Mannek's fourth goal of the season made the score 4-2 nine minutes into the second period. Loewen's had trick doubled his goals total for the season. Martin Lang, Connor Zary and Carson Denomie also scored for the Blazers. Portland was 1 for 3 on the power play, Kamloops 2 for 6. The Hawks outshot the Blazers 34-28.